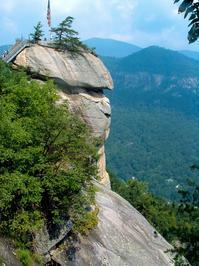 The short description of this hike could simply be "Hike all of Chimney Rock's trails!" 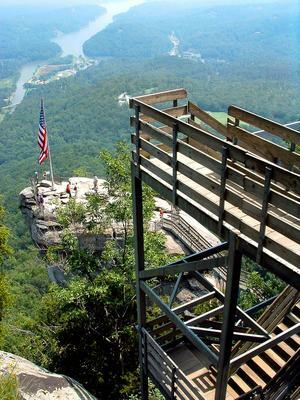 Though Chimney Rock may resemble a theme park more than it does a wilderness, the trail network provides a way to enjoy the park from a more natural perspective. Though the trail system here is a bit unorthodox and even involves an elevator as an option, this hike is a good workout and takes you to undisturbed areas of natural seclusion. This hike hits all the high points in Chimney Rock Park: the Meadows, the Chimney, Hickory Nut Falls, and Exclamation Point. Make your way to Asheville and take I-240 East to US 74A East. Follow 74A East for approximately 25 miles to the entrance for the Park in the town of Chimney Rock, on the right. From the I-40 corridor - points east such as Hickory, Statesville, or Raleigh - take exit 103 for US Hwy. 64. Turn left and follow 64 West for just over 50 miles to the park entrance on the left in the town of Lake Lure. US 64 merges with Hwy. 74A in Rutherfordton; just stay on US 64 the whole way. From the Charlotte area, take US Hwy. 74 East toward Forest City. Take exit 167 for NC Hwy. 9 North and go just under 12 miles to Lake Lure. Turn left on US Hwy. 64/74-A and go about 5 miles to the park entrance on the left. Take I-26 West across the North Carolina border. Take Exit 67 for NC Hwy. 108 and go about 5 miles to NC Hwy. 9 North. Turn left on NC Hwy. 9 North and go about 9 miles to US Hwy. 64/74A. Turn left on US Hwy. 64/74A and go aout 5 miles to the park entrance on the left. Once you're on the access road, park at The Meadows, just beyond the ticket gate. 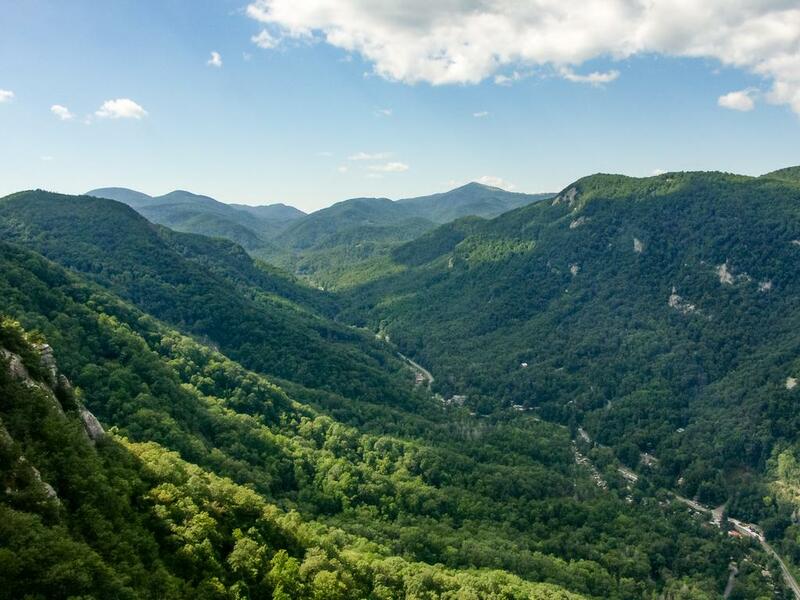 This hike carries the distinction of including all the publicly accessible hiking trails in Chimney Rock at Chimney Rock State Park, making it a great way to enjoy the park from a hiking-oriented perspective. A well-constructed section of the Four Seasons trail goes around a curve in the forest. Begin the hike on the Four Seasons trail at the upper end of the parking area, across the road. Watch for traffic as you cross. The Exclamation Point overlook is over 1000 ft above The Meadows area, and so the trail begins climbing immediately, gently and along the park road at first. The trail pulls away from the road leaving some of the commotion behind and dips into a cove, where it may be wet and there is some kind of old spring house structure to the side of the trail. Beyond the cove the trail climbs steeply into a quiet area of the forest. This is a great area (as the trail's name suggests) to watch for changes in the forest over the course of the four seasons. It passes through a mixed hardwood forest with a typical understory of Carolina rhododendron and mountain laurel. You may even spot deer and wild turkeys in this area. Some of these species are not found along the Park's other trails. Interpretive signs are present to help you identify what you might see. You'll also pass by some neat rock formations and under one giant overhang - a preview of things to come throughout the rest of the park. Some sections of the Four Seasons trail are steep and in very poor condition (although an update August 2013 by the park says there have been improvements). Other sections are more level and better maintained. 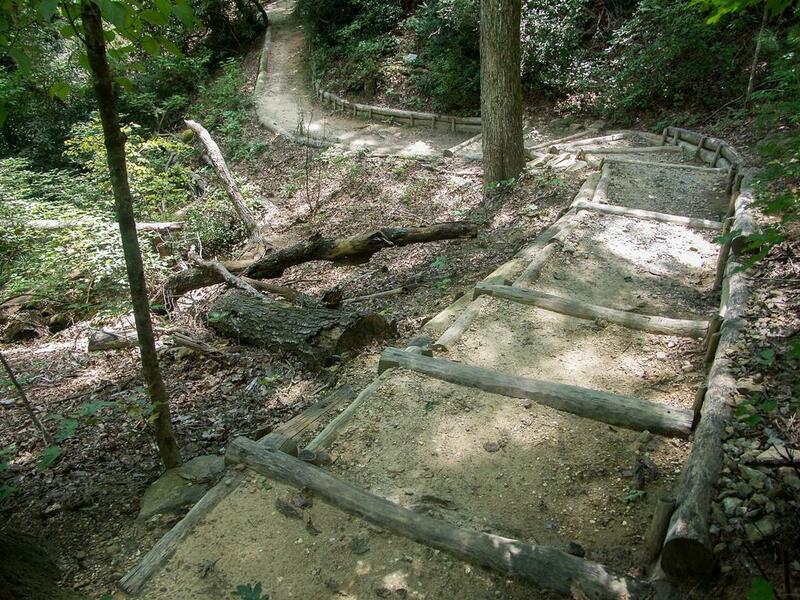 There are plenty of bridges and step structures; the last leg of this trail is a set of 70 stairs leading straight uphill to the junction with the Hickory Nut Falls trail. 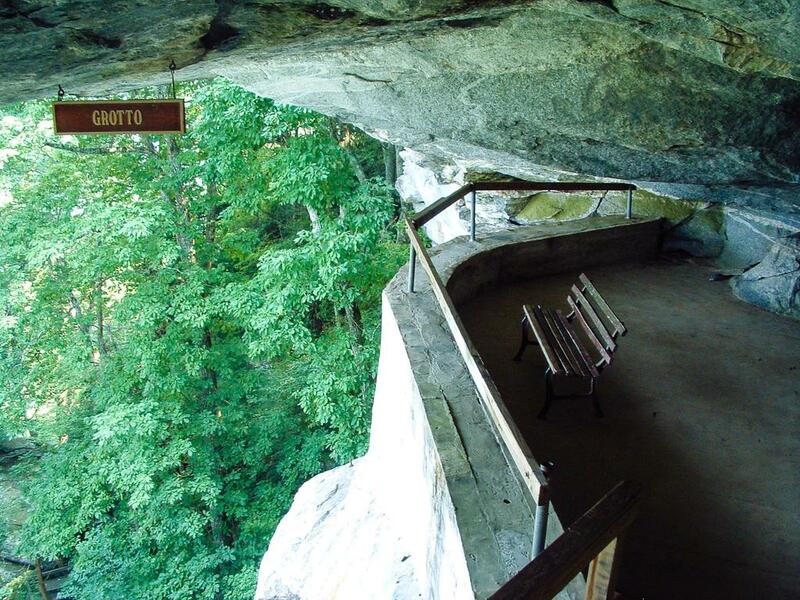 You've climbed 400 ft at this point - now you'll take a break on the much easier trail leading to the falls. Turn right here. 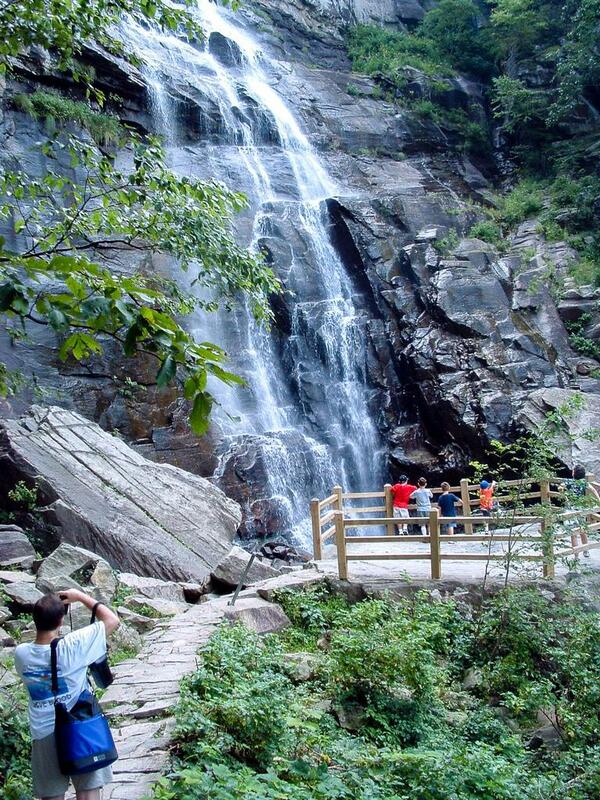 The Hickory Nut Falls trail is an old road bed and climbs gently. This trail was formerly known as the Forest Stroll until the more appropriate, current name was applied. Some sections are rocky, but the hills are generally mild and it continues through the hardwood forest. One thing you will definitely notice is an increase in foot traffic. The Four Seasons trail is usually a nice respite from the typical activity in the park on a busy day. Limited views, especially in the wintertime, of Rainbow Falls across the Hickory Nut Gorge appear through the trees on the right. To the left is the rocky slope at the bottom of the cliff band encircling the gorge. And it's that cliff band over which Fall Creek plunges to form the falls, which you'll reach the bottom of at a viewing platform. There's also a picnic table here if you're ready to stop and eat. Though the falls is very high, it's dubious that the height exceeds 400 ft. Modern satellite elevation data pegs them at about 350 ft, which aligns exactly with claims from folks who've dropped a string over the falls for a more direct measurement. Either way, it's still a high, impressive waterfall, especially during rainy periods. When you're ready to see more, turn around and return to the Four Seasons Trail junction, except continue straight this time until you reach the junction with the Outcroppings trail on the right. You've now hiked most of the natural surface "trail" in the park, and things start to get interesting. Your next destination will be the Chimney - the park's namesake and a must-visit feature despite any crowds. To reach it, you have two choices. 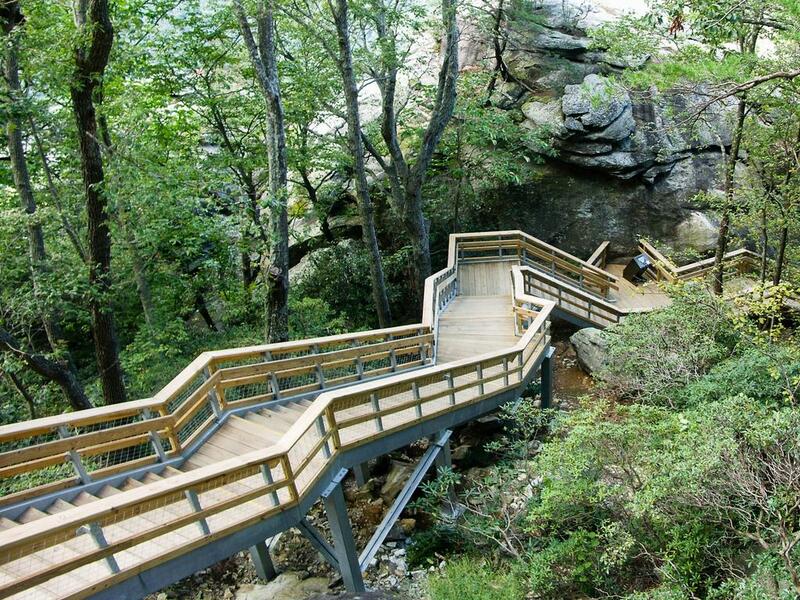 This impressive, sturdy new stair structure makes up the Outcroppings trail in Chimney Rock State Park. You can either turn right here and climb the 499 steps up the Outcroppings trail. It's a 315 ft ascent, and it passes through an amazing series of boulders and rock features with catchy names like the Grotto, Subway and Pulpit Rock. 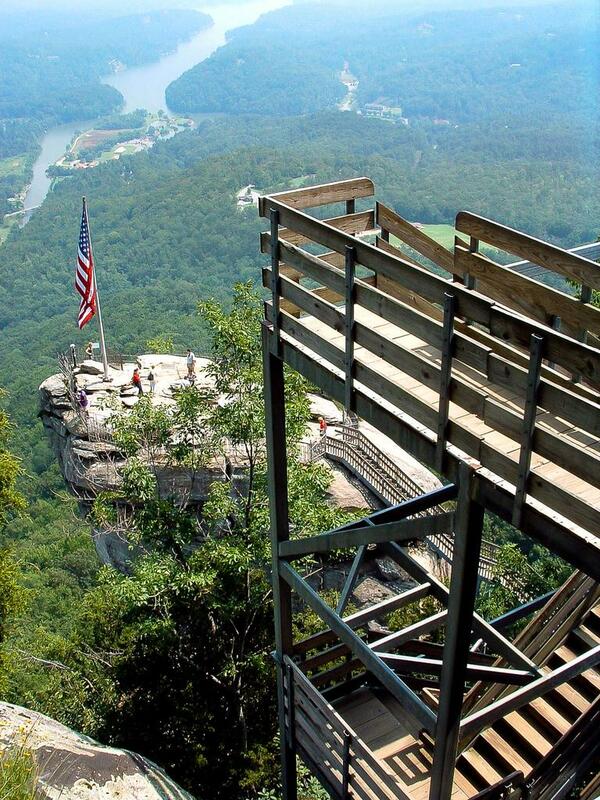 From these vantage points, you can see views of Hickory Nut Gorge, the Carolina Piedmont and Lake Lure - previews to what's to come atop Chimney Rock. While your heart will (eventually) thank you for the climb, there is an alternative: straight ahead, through the gift shop, is a unique elevator that will take you up the 26 stories needed to reach the Chimney. Don't worry, you'll still be able to take the Outcroppings staircase on the way back down. Of course, if you want the exercise, you can still take the elevator down on the way back and save some wear and tear on your knees without feeling too guilty. It's really neat, and while it's certainly not typical for a hike, I do recommend using the elevator in one direction and the Outcroppings trail in the other. Once you're at the top, take the steps to the Chimney. This is on the left if you came up via the Outcroppings or through the gift shop if you used the elevator. A short set of steps leads out onto the Chimney, and there are views in all directions. A railing marks the perimeter of the overlook, but keep your eye on kids and pets. This is the most iconic viewpoint in the park. Could the views get more grand than this? Yes, with an exclamation point! In fact, the Exclamation Point trail is the next destination on the hike, and it begins at the other side of the stairs leading up to the Chimney. Formerly known as "Skyline", this "trail" begins with another staircase structure that leads straight up the cliff. This one gave up on any attempt at blending in with the landscape and just looks like a tower. Still, it's unique, provides great views, and a great workout as you climb. Once you're at the top of the tower, you're still not done gaining elevation. The trail - somewhat of a real path again now - zig-zags up through sets of rock and wooden staircases, and disappears back into the trees again. The forest here is a dry-adapted cliff-top variety, and you'll find plenty of wildflowers in summertime. Trees such as chestnut oak and Carolina hemlock grow in this cliff-top environment. You'll pass a small rain shelter before popping out onto the rocky overlook at Exclamation Point. The views are similar to what you saw on the Chimney, only higher up, and providing a better look to the west up the Hickory Nut Gorge. Steel cable fences surround the overlook making it relatively benign but do watch small children and don't attempt to climb over them for a "better" view. A late summer view of the Hickory Nut Gorge from Excalamation Point. (Pun intended). Once you're done soaking up the sights, return down the Exclamation Point trail and descend the stair tower. If you saved any of the side trips to the various rock features, now's a good time to check them out. 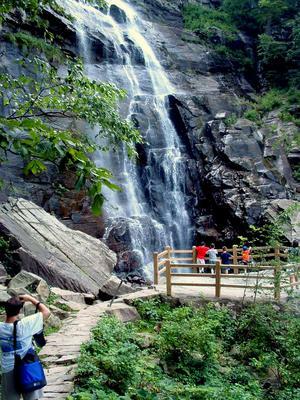 Return to the Hickory Nut Falls trail via either the elevator or the Outcroppings trail (and check out those short side paths if you take the Outcroppings), then turn left on the Hickory Nut Falls trail back to the Four Seasons trail junction. Descend the Four Seasons trail and cross the park road to return to your vehicle and finish the hike. If you want to cross every trail in the park off your list (and why not! ), proceed to the 0.6 mi Great Woodland Adventure trail, a short loop starting at the upper end of the Meadows and wrapping through the forested slope south of the park road. This is a Kids in Parks TRACK trail, and it's designed to keep the little ones going with various signs, animal figurines, and activities along the way. Even if you don't have kids, it's a nice way to round out a great hike in Chimney Rock Park. Anita said: Went to the falls today.Shuttle bus ride to just below the parking area. Bus ride especially back down is not for the faint hearted. Good hike to the falls. Not easy. Moderate. Hike back is mostly down hill with 499 steps back to the top.Were disappointed that more info on trail was not given. Never would have hiked it if we knew. One of our dogs who has hiked with us many times got over heated. Will not be going back.Many other hikes with wonderfull views for free.